Duke University Press Books, 1997-04-30. Hardcover. Used:Good. Duke University Press -, 1997. PB/pub.1997/Gd. condition/256 pages - Documents the contributions of Native Americans to the notion of American Nationhood. [AN229823]. Duke University Press Books, 1997-04-30. Hardcover. Good. Duke University Press Books. PAPERBACK. 0822319446 New Book! Buy now while supplies last! Limited availability! ------?Indian Nation offers thorough scholarship, good sense, and a clear style. The insightful overviews and fine brief accounts of Pearce, Slotkin, and Rogin are particularly valuable.? 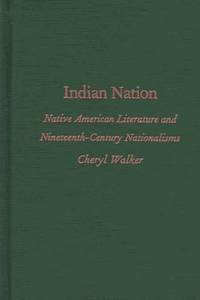 ?------------------------------------ ?Cheryl Walker demonstrates the integral parts played by native Americans in the development of the nineteenth-century American discourse about nationality. Not only does this important scholarly work remind us how fundamentally democratic institutions are indebted to native American cultures, it also teaches us that native Americans have been actively and complexly involved in the crucial political debates of our modernity. Indian Nation helps dismantle the odious but persistent myth of the ?Vanishing American.?? ?------------------------ ------------------ Description Indian Nation documents the contributions of Native Americans to the notion of American nationhood and to concepts of American identity at a crucial, defining time in U.S. history. Departing from previous scholarship, Cheryl Walker turns the "usual" questions on their heads, asking not how whites experienced indigenous peoples, but how Native Americans envisioned the United States as a nation. This project unfolds a narrative of participatory resistance in which Indians themselves sought to transform the discourse of nationhood. Walker examines the rhetoric and writings of nineteenth-century Native Americans, including William Apess, Black Hawk, George Copway, John Rollin Ridge, and Sarah Winnemucca. Demonstrating with unique detail how these authors worked to transform venerable myths and icons of American identity, Indian Nation chronicles Native American participation in the forming of an American nationalism in both published texts and speeches that were delivered throughout the United States. Pottawattomie Chief Simon Pokagon's "The Red Man's Rebuke," an important document of Indian oratory, is published here in its entirety for the first time since 1893.---------------------------------------- About the Author Cheryl Walker is Richard Armour Professor of Modern Languages and Director of the Humanities Institute at Scripps College. She is the author of The Nightingale?s Burden: Women Poets and American Culture Before 1900. . New.